Your credentials are valuable to criminals and other unauthorized users, and they’ve increased their efforts to compromise you and the University through phishing emails. 2-Step can keep the bad guys out even if they get your username and password through a phishing attempt. 2-Step is quickly becoming the standard for business and education and you may already be using 2-Step to access your banking information or Gmail account. Visit its.unc/edu/2-Step for more information and step-by-step instructions to get started with 2-Step. How will 2-Step change your ConnectCarolina experience? As time goes on, more ConnectCarolina functionality will be protected with 2-Step. When you will be asked to complete 2-Step will depend on what you use ConnectCarolina for. Receive a code or notification to your phone via text, mobile app or voice call to confirm your access request. Use the buttons below to learn more about how 2-Step affects ConnectCarolina. 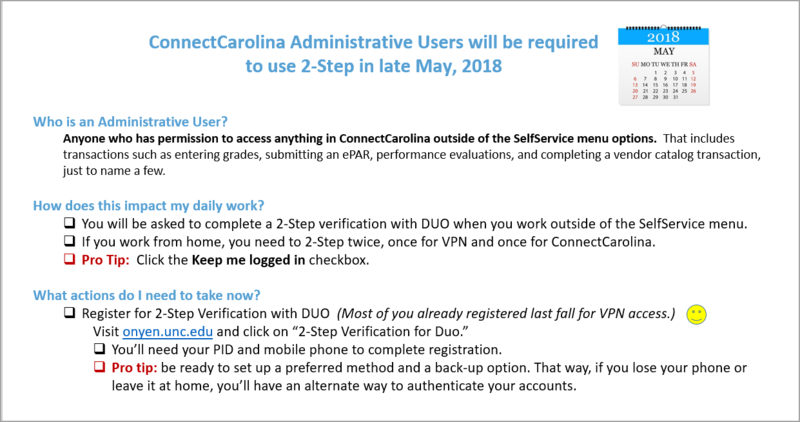 If you use any part of ConnectCarolina except SelfService, then starting May 23, you’ll be required to use 2-Step/Duo to access ConnectCarolina. 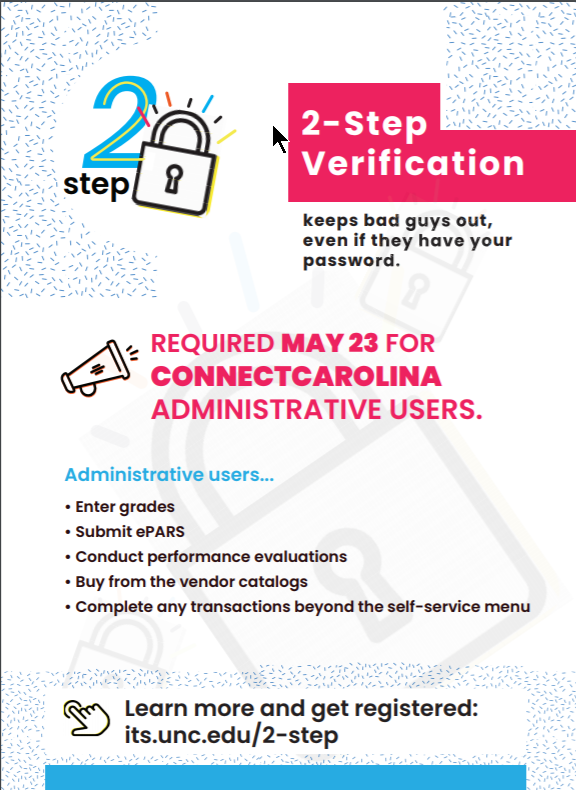 That means if you enter grades, submit ePARs, conduct performance evaluations, buy from the vendor catalogs you’ll need to verify with 2-Step/Duo to get in to ConnectCarolina. The good news is that you may have already set up 2-Step Verification with Duo in order to access VPN or your W-2. If you haven’t already, now is the time to register for 2-Step Verification. Visit onyen.unc.edu and click the 2-Step Verification for Duo link. You’ll need your PID and mobile phone to complete registration. Pro Tip: Be sure to set up a preferred method and a back-up option (Push, Call Me or Enter a Passcode). That way, if you lose your phone or leave it at home, you’ll have an alternate way to authenticate. How does this impact my daily work? 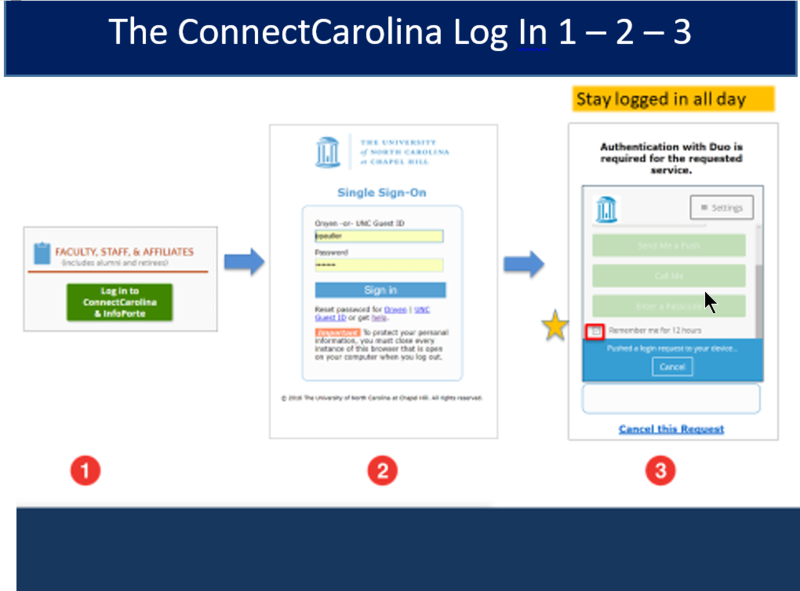 When you click the Log in to ConnectCarolina & InfoPorte green button, you will see the Duo screen to complete 2-Step verification. If you work from home, you need to 2-Step twice, once for VPN and once for ConnectCarolina. Pro Tip: If you change browsers, you will be asked to complete 2-Step verification for the second browser. If you need help with the registration process, use the documentation available athttps://help.unc.edu/help/duo/. You can also live chat with the ITS Service Desk at help.unc.edu, call 919-962-HELP or visit us in person for assistance. 2-step is required to access Student Financials – Pay My Bill. Starting February 15, 2018, 2-Step will add another layer of security to access Student Financial – Pay My Bill information, including direct deposit accounts for student refunds. We understand that some students share their Onyen and passwords with their parents, but with 2-Step, parents won’t be able to get in unless they have access to their student’s mobile phone. Students need to set their parents up as a Proxy/Authorized User so that they aren’t required to use 2-Step. Note: Currently, alumni are not required to use 2-Step to access their financial information. IMPORTANT: Any time your bank account is changed you will receive an email confirmation from cashier@unc.edu. If you receive an email and you did not request an account change, please call 962-HELP immediately and request a critical ticket. Bill Payment Due on March 13: Do your parents pay your bills? They must be set up as Proxy/Authorized Users to access Student Financials. As Proxy/Authorized Users they will not need 2-Step. Keep in mind that they will not be able to use your Onyen credentials. Your tax year 2017 W-2 is available from the self-service menu on the ConnectCarolina home page. Remember that you’ll need to register for and then use 2-Step verification to access your online W-2. The registration process only happens once, but you’ll need to use 2-Step Verification every time you need to access your W-2 online. An advantage of accessing your W-2 form online is that you can print and use it sooner than the paper version issued in late January by Payroll Services. Paper W-2s are still available through Payroll and will continue to be for 2017. Important: Opting into 2-Step Verification does not opt you out of a paper copy. Do I have to have a smartphone to verify my identity? No, you can use any cell phone, a tablet, or even a landline phone. We recommend that you use an app on your smartphone or tablet to verify, but you don’t have to. You can also verify using a text message or phone call. I've been locked out--what do I do? If you try to verify three times and are not successful, you will need to contact 919-962-HELP to have your account unlocked so you can try again. I'm set up to verify using my smartphone, but I left my phone at home today. What do I do? If you need to verify often, we recommend that you set up more than one device. You can set up a landline phone or a tablet in addition to your mobile phone. That way, if you forget one device, you still have a way to verify. If you didn’t register more than one device, you need to contact 919-962-HELP(4357) for a temporary passcode. I no longer have the phone that I set up to verify with. What do I do? You can remove all devices ( on the DuoSecurity Self-Registration screen; ITS employees (and some other groups) do not see this screen) when you login to Register & Manage 2-Step Verification and then you can register another device. For more FAQs and to troubleshoot complex issues, ITS has extensive documentation on 2-step. When: Monday, February 12, 12:00 pm – 2:00 pm. Look for the 2-Step Information table outside of Lenoir Hall. Stop by and pick up information about Student Financials and 2-Step. Learn how and when to 2-Step and grab some swag! 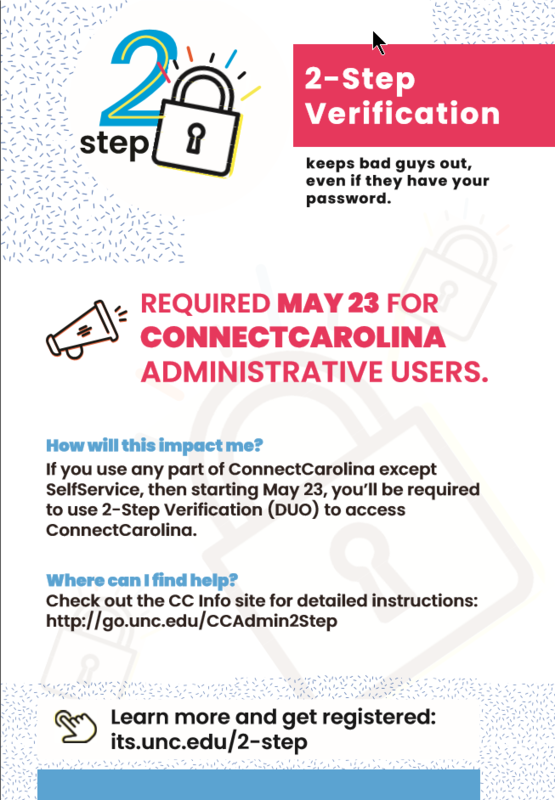 May 23, 2018: Required for students, faculty, and staff who have access to any ConnectCarolina options outside of those included under SelfService. If you enter grades, conduct performance evaluations, submit ePARS and many more transactions.